Why not visit Conifox during half-term break (11th – 17th February) to take part in our “Seek the hidden hearts” trail. Cupid has lost 13 Hearts around Conifox Adventure Park and needs help to find them. Pick up your trail Pack from the Adventure Park Cabin and help Cupid spread the love this Valentine’s!! Cost £1.50 (not included in park entry). 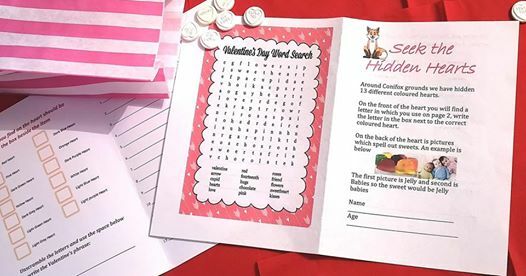 Once you have found all the hidden hearts, hand in your completed booklet to claim your goodie bag. No booking required, can be purchased upon entry to the park!